The Cup Series and Xfinity Series have their special events — special to each individual series. The Cup Series has more than one in the All-Star Race and the Busch Clash. The Xfinity Series has its Dash 4 Cash program. What does the Truck Series have? It has a yearly dirt race at Eldora. Run the Xfinity and/or Cup cars on dirt somewhere, even if not at Eldora, and that Truck Series race at Eldora will lose some of its luster. That series is already struggling, so why takes its one special event away? Secondly, too much of a good thing isn’t a good thing. Or at least it becomes not quite as good. More NASCAR racing on dirt takes away the luster from the one we have now, the Eldora Dirt Derby. Remember when night racing was special and cool? Then, the schedule became somewhat oversaturated with night racing and now, quite frankly, the only night racing that seems at least somewhat special to me is that August date at Bristol (Ten.) Motor Speedway. Okay, so one Cup race on dirt and one Xfinity race on dirt added to the Truck race means just one race per series on dirt, so that’s not really oversaturation, but it brings me around to my initial argument. If Cup cars run a race on dirt, and Xfinity Series cars run a race on dirt, what makes that Truck Series race so darn special. 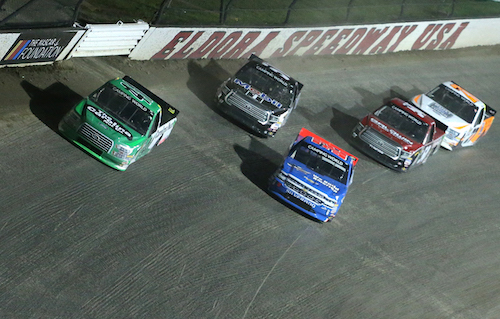 And if that Truck Series race at Eldora isn’t special anymore, what special event does the Truck Series have left? Answer: there isn’t one. I like dirt racing, and I love the Eldora Dirt Derby, but lets leave the dirt to the trucks, at least as far as NASCAR is concerned.